برزگر, مهسا, بهروز, ربیع, منصوری, حمیدرضا, کاظمی نجفی, سعید. (1396). ارزیابی عملکرد چسب اصلاح شده آرد کلزا در ساخت تخته لایه. مجله صنایع چوب و کاغذ ایران, 8(4), 631-643. مهسا برزگر; ربیع بهروز; حمیدرضا منصوری; سعید کاظمی نجفی. "ارزیابی عملکرد چسب اصلاح شده آرد کلزا در ساخت تخته لایه". مجله صنایع چوب و کاغذ ایران, 8, 4, 1396, 631-643. برزگر, مهسا, بهروز, ربیع, منصوری, حمیدرضا, کاظمی نجفی, سعید. (1396). 'ارزیابی عملکرد چسب اصلاح شده آرد کلزا در ساخت تخته لایه', مجله صنایع چوب و کاغذ ایران, 8(4), pp. 631-643. برزگر, مهسا, بهروز, ربیع, منصوری, حمیدرضا, کاظمی نجفی, سعید. ارزیابی عملکرد چسب اصلاح شده آرد کلزا در ساخت تخته لایه. مجله صنایع چوب و کاغذ ایران, 1396; 8(4): 631-643. هدف از این تحقیق، ارزیابی عملکرد چسب اصلاح شده آرد کلزا در ساخت تخته لایه بود. به همین منظور، ابتدا آرد کلزا با هیدروکسید سدیم و اوره/هیدروکسید سدیم به طور جداگانه اصلاح شد. سپس به منظور ایجاد اتصالات عرضی بین مولکول‌های پروتئین، درصدهای مختلفی از ایزوسیانات (5، 15 و 30%) بر مبنای وزن خشک آرد کلزا به دوغاب حاصل اضافه گردید. نتایج نشان داد، با افزایش قلیا و اوره به چسب آرد کلزا، مقاومت خشک برشی آزمونه‌ها در مقایسه با چسب اصلاح نشده به طور معنی‌‌داری افزایش یافت. افزایش میزان ایزوسیانات در چسب‌ها نیز سبب بهبود بیش‌تر این ویژگی شد. 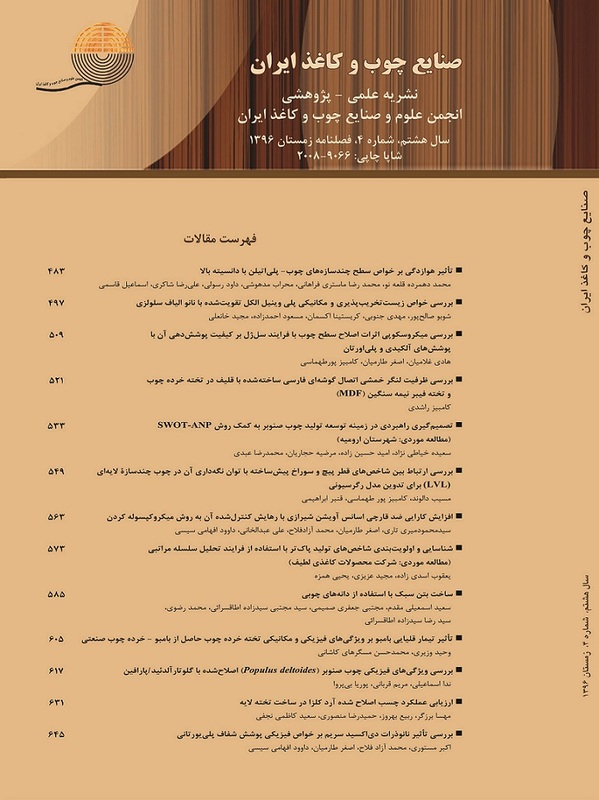 در این تحقیق، مقاومت خشک برشی همه چسب‌های اصلاح شده بیش از حد استاندارد 2-314 EN-بود. هم‌چنین، اصلاح شیمیایی چسب‌ها سبب بهبود مقاومت به آب آن‌ها نیز شد، به نحوی که برخی از آن‌ها در توالی‌های غوطه‌وری/خشک کردن رفتاری مشابه یا نزدیک به چسب اوره فرمالدهید از خود نشان دادند. "چسب آرد کلزا"؛ "مقاومت برشی"؛ "مقاومت به آب"؛ "اوره فرمالدهید"
 Zhang, Y., Zhu, W., Lu, Y., Gao, Zh. and Gu, J., 2014. Nano-scale Blocking Mechanism of MMT and its Effects on the Properties of Polyisocyanates-modified Soybean Protein Adhesive. Industrial Crops and Products, 57: 35-42. Gui, C., Wang, G., Wu, D., Zhu, J. and Liu, X., 2013. Synthesis of a Bio-based Polyamidoamine-Epichorohydrin Resin and its Application for Soy-based Adhesive. International Journal of Adhesion and Adhesives, 44:237-242. Chen, N., Lin, Q., Zeng, Q. and Rao, J., 2013. Opimization of Preparation Conditions of Soy Flour Adhesive for Plywood by Response Surface Methodology.Industrial Crops and Products, 51: 267-273. Lin, Q., Chen, N., Bian, L. and Fan, M., 2012. Development and Mechanism Characterization of High Performance Soy-based Bio-adhesive. International Journal of Adhesion and Adhesives, 34:11-16. Xu, Y., Wang, Ch., Chu, F., Frihart, C.R., Lorenz, L. and Stark, N.M., 2012. Chemical Modification of Soy Flour Protein and its Properties. Advanced Material Research, 343-344:875-881. Zhong, Z., Sun, X.S., Fang, X. and Ratto, J.A., 2002. Adhesive Strength of Guanidine Hydrochloride Soy Protein for Fiberboard Application. International Journal of Adhesion and Adhesives, 22: 267-272. Xu, H., Ma, S., Lv, W. and Wang, Z., 2011. Soy Protein Adhesives Improved by SiO2 Nanoparticles for Plywoods. Pigment and Resin Technology, 40(3): 191-195. Kumar, R., Choudhary, V., Mishara, S. and Varma, I., 2004. Enzymatically Modified Soy Protein Part 2: Adhesion Behavior. Journal of Adhesion Science and Technology, 18: 261-273. Li, N., Qi, G., Sun, X. S. and Wang, D., 2012, a. Effects of Sodium Bisulfite on the Physicochemical and Adhesion Properties of Canola Protein Fractions. Journal of Polymer and Environment, 20: 905-915. Li, N., Qi, G., Sun, X.S., Stamm, M. and Wang, D., 2012, b. Physicochemical Properties and Adhesion Performance of Canola Protein Modified with Sodium Bisulfite. Journal of American Oil Chemists Society, 89: 897-908. Johns, W.E. and Niazi, K.A., 1980. Effect of pH and Buffering Capacity of Wood on the Gelation Time of Urea-formaldehyde Resin. Wood and Fiber Science, 12(4): 255-263. Cheng, E. and Sun, X., 2004. Adhesive Properties of Modified Soybean Flour in Wheat Straw Particleboard. Composites Part A: Applied Science and Manufacturing, 35: 297-302. Li, H., Li, C., Gao, Q., Zhang, SH. and Li, J., 2014. Properties of Soybean-flour-based Adhesives Enhanced by Attapulgite and Glycerol Polyglycidyle Ether. Industrial Crops and Products, 59: 35-40. Rohumaa, A., Hunt, Ch., Hughes, M. and Frihart, C.R., 2016. Lathe Check Formation and their Impact on Evaluation of Veneer-based Panel Bond Quality. In: World Conferences on Timber Engineering (WCTE), August 22-25, Vienna, Austria. European Standard EN 314. 1993. Plywood -Bonding Quality, European Standardization Committee, Brussel. American National Standard for Hardwood and Decorative Plywood, 2009. ANSI/HPVA HP-1, 36 pp. Sun, X. and Bian, K., 1999. Shear Strength and Water Resistance of Modified Soy Protein Adhesives. Journal of the American Oil Chemists Society, 76 (8): 977-980. Grant, C.A., Derksen, D.A., Mclaren, D.L. and Irvine, R.B., 2011. Nitrogen Fertilizer and Urease Inhibitor Effects on Canola Seed Quality in a One-pass Seeding and Fertilizing System. Field Crops Research, 121: 201-208. Chen, J.P. and Isa, K., 1998. Thermal Decomposition of Urea and Urea Derivatives by Simultaneous TG/DTA/MS. Journal of Mass Spectrometry Society of Japan, 46 (4): 299-303.